KurzweilAI.net "How to Create a Mind" "The Singularity Is Near"
Ray Kurzweil is one of the world’s leading inventors, thinkers, and futurists, with a thirty-year track record of accurate predictions. Called "the restless genius" by The Wall Street Journal and "the ultimate thinking machine" by Forbes magazine, he was selected as one of the top entrepreneurs by Inc. magazine, which described him as the "rightful heir to Thomas Edison." PBS selected him as one of the "sixteen revolutionaries who made America." Ray has written five national best-selling books, including New York Times best-sellers "The Singularity Is Near" (2005) and "How To Create A Mind" (2012). He is Co-Founder and Chancellor of Singularity University and a Director of Engineering at Google heading up a team developing machine intelligence and natural language understanding. 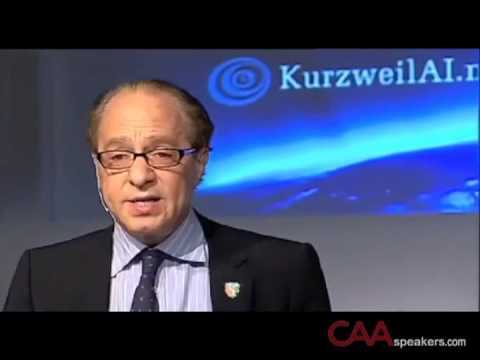 "CAA Speakers - Ray Kurzweil"
"Get Ready for Hybrid Thinking"
"Ray Kurzweil sees Immortality in Our Future"
The democratization of innovation is a turbulent process with rapid creation, violent destruction, many winners and many losers. Despite the apparent chaos, we can discern predictable patterns. The pace of innovation itself is doubling every decade. The overall price-performance and capacity of every form of information technology grows exponentially, generally doubling in a year or less. As information technology achieves each new level of price-performance and capacity, new applications become feasible and existing business models lose their viability. Another implication is that the tools of disruptive change have been democratized. A couple of students created Google on their thousand dollar laptops. A few years later, a couple of undergraduates created Facebook with tools that everyone has. The rate of change is now so rapid that even three to five year business plans need to consider that every level of an industry will undergo major changes during that period. It’s not just the devices we carry around that are influenced by these exponential changes. Health and medicine is now an information technology with the collection of the human genome, the means of changing genes in a mature individual, and the ability to design interventions on computers and to test them on biological simulators. Even energy will be transformed as we apply nanotechnology to the design of solar panels and energy storage devices. The means to change the world are in everyone’s hands.